My friend, Dave Taylor, from Colorado, interviewed me today about the Kickstater campaign and asked some great questions about what we’re working toward, why Machu Picchu, and what makes Interactive Books so special. Dave also has backed the effort so we want to doubly thank him for his generosity and support. 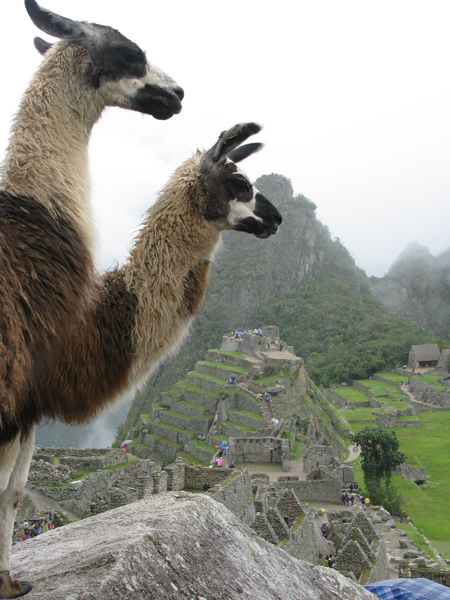 So, along the lines of, “A llama walks into a bar,” here are two llama overlooking Machu Picchu in Peru. It just begs a funny cutline, caption or quote. The photo was taken by Dr. Mark Van Stone who visited Machu Picchu back in January of 2011. We’ve received dozens of photos from him about this incredible site, but this one just jumped out at us. We want to have a serious site, but there are times, too, when it just makes sense to let one’s hair down a little. So if you could write a caption for this photo, what would you say? We’ll give a $25 iTunes gift card to the person who can come up with the funniest caption or comment. (No profanity or vulgarity here). We’ll leave the contest open until Saturday, March 10, 2012, at 5 p.m. CST.